Maybe you have heard of someone whose spleen was enlarged while they had a mono infection, or maybe one of your friends injured their spleen in a car accident. Many people, however, don't even know where it is located. Your spleen is located in the upper left side of your abdomen. 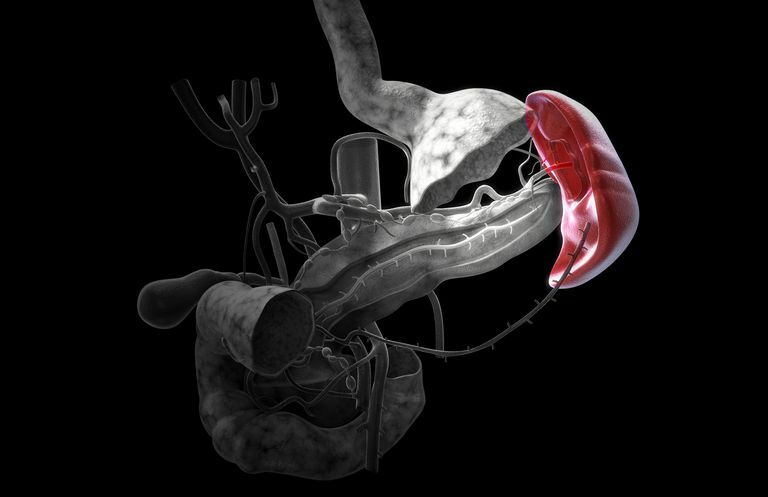 The stomach and one end of the pancreas (called the tail) are very close to it. Normally, the spleen is unable to be felt on exam, as it is tucked under the ribcage. However, if your spleen enlarges, called splenomegaly, your physician (or you) may be able to feel it. The spleen is a special organ that has multiple jobs. It is considered a member of the lymphatic system which includes lymph nodes, tonsils, and adenoids. Its major function is to remove "junk" from the blood stream. The spleen somewhat resembles a sponge with lots of little holes in it (called sinusoids). All of our blood is filtered by the spleen. One of its jobs is to remove bacteria from the blood. In particular, the spleen is crucial for removing what are called encapsulated bacteria from the blood. If the spleen does not function properly or has to be surgically removed, you are at higher risk of infection from these bacteria. The spleen is also the place where blood cells marked for destruction by the immune system are removed. This occurs in conditions like autoimmune hemolytic anemia (red blood cells) and immune thrombocytopenia (platelets). The spleen also assesses the quality of our red blood cells. If a red blood cell is near the end of its lifespan or is unable to move through the blood system appropriately, the spleen removes it from circulation. Also if there are things in the red blood cells that shouldn't be there, the spleen can remove these items. Sickle cell disease: In sickle cell disease, the sickled red blood cells are not flexible and can be trapped in the spleen, causing the spleen to expand. As more and more red blood cells are trapped in the spleen, it gets larger and larger. This is called splenic sequestration crisis and can cause anemia that may require blood transfusion. Sickled red blood cells also damage the tissue of the spleen, leading to a spleen that cannot function normally. This is why people with sickle cell disease are at higher risk of infection. Thalassemia: Early in development (prior to birth), the spleen is responsible for making the blood cells. In thalassemia, the bone marrow has difficulty making red blood cells, so the spleen enlarges in an effort to produce more red blood cells. Hereditary spherocytosis: In hereditary spherocytosis, the red blood cells have an abnormal shape and get trapped in the spleen. This may result in splenomegaly. Additionally, due to the abnormal shape, they are removed prematurely by the spleen. In some patients with severe anemia, removal of the spleen may be a recommended treatment. Infections: It is not uncommon in viral infections for the spleen to become enlarged. This is similar to when the lymph nodes in your neck become enlarged during illness. The most common infection associated with spleen enlargement is "mono" or mononucleosis, caused by the Epstein Barr virus. Also, outside the United States, malaria is a major cause of splenomegaly. Cancer: The spleen is considered a lymph organ, and can be involved in lymphomas (cancer of the lymphatic system). It can also be enlarged in leukemia, a cancer of the white blood cells. Myeloproliferative neoplasms: People with primary myelofibrosis or polycythemia vera often have splenomegaly as part of their condition. Portal hypertension: In portal hypertension, the blood can not flow easily from the spleen into the liver, causing trapping of blood in the spleen resulting in splenomegaly. Trauma: Trauma to the spleen, as may be seen in a motor vehicle accident, can damage or cut the spleen. Inflammatory conditions: Inflammatory conditions like rheumatoid arthritis, lupus, and sarcoidosis can cause inflammation in the spleen resulting in splenomegaly. How Can You Live Without Your Spleen? Despite the important functions of the spleen, you can live without one. In some medical conditions, surgical removal of the spleen (splenectomy) might be the treatment of choice. After splenectomy, you are at greater risk of bacterial infection. This risk can be lessened by vaccines and having emergent medical evaluation if you experience fever. If the spleen is removed, the liver can take over removing aging or abnormally-shaped red blood cells. Benefits and risks of splenectomy should be discussed with your healthcare provider prior to the procedure. The spleen is an important organ with many tasks. Splenomegaly, enlargement of the spleen, is generally a sign of some other medical condition. In general, it is treated by treating the underlying condition. Although splenectomy can be a helpful treatment in many of these medical conditions, it is not always necessary. If a splenectomy has been recommended, make sure you discuss with your physician the reasons why you should have this surgery and what the potential risks are. In the end, many people live full and healthy lives without their spleens. Schrier SL. (2017). Approach to the Adult Patient With Splenomeagaly and Other Splenic Disorders. In TW Post, WC Mentzer and JS Tirnauer (eds.) UpToDate. McClain KL. (2017). Approach to the Child With an Enlarged Spleen. In TW Post, DH Mahoney, and C Armbsy (eds.) UpToDate.